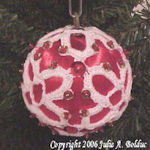 Lacet Ball Ornament -- $1.99 A Crochet pattern from Julie A Bolduc. 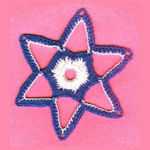 This ornament is made with a different color combination but you could use any color thread you want. 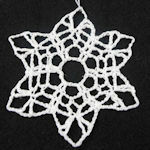 When I made this ornament I had envisioned a bunch of these hung around a reception hall of a wedding with silver and white decorations all around.